A friend who knows I love Chicken and Dumplings sent me this one. Can't wait to try it. I've requested a link from where this came from. Will add the link once I get it. Hows this sound to you cooks out there? If you make your chicken and dumplings different please post the difference here. In a bowl, combine the flour, baking powder and salt. Cut the butter into the dry ingredients with a fork or pastry blender. Stir in the milk, mixing with a fork until the dough forms a ball. Heavily flour a work surface. You’ll need a rolling pin and something to cut the dumplings with. I like to use a pizza cutter. I also like to use a small spatula to lift the dumplings off the cutting surface. Roll the dough out thin with a heavily floured rolling pin. Dip your cutter in flour and cut the dumplings in squares about 2″x 2″. It’s okay for them not to be exact. Just eye ball it. Some will be bigger, some smaller, some shaped funny. Use the floured spatula to put them on a heavily floured plate. Just keep flouring between the layers of dumplings. To cook them, bring the broth to a boil. Drop the dumplings in one at a time, stirring while you add them. The extra flour on them will help thicken the broth. Cook them for about 15-20 minutes or until they not doughy tasting. Add the cooked chicken to the pot and you’re done! Doc, it's been years since I've made Chicken and Dumplings, but the last time I made it, I made the dumplings that way. 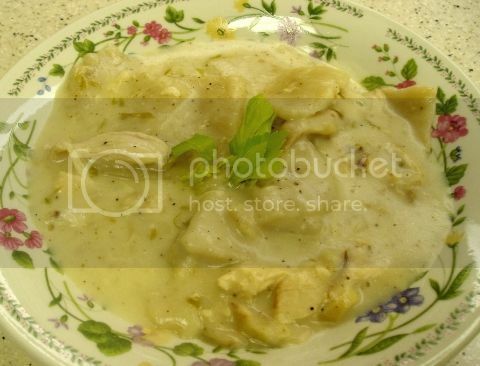 That's a fine looking bowl of chicken and dumplings, and the recipe sounds really good. I may have to try the milk in the dumpling method. His/her recipe is very similar to what I do. I usually start with a half of a chicken, just barely cover it with water, add some black pepper and chopped celery tops. Cook, remove, de-skin and de-bone, chop. I use flour, butter (used to use Crisco), and broth to make the dumplings. Sometimes I'll add a little butter to the broth when I put in the dumplings. The milk (I've also used half-and half) and chicken go into the broth when the dumplings are finished cooking. Let it thicken. I don't time or measure for chicken and dumplings. Boy, oh boy, group! Now you're really talking! 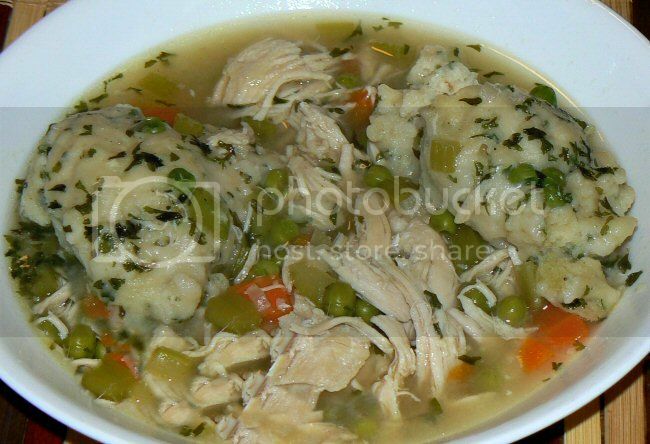 Those bowls of chicken and dumplings in all the posts look just delicious! Now I'm absolutely starving here and DW is at work. I've been banished from the kitchen for at least another week before I'm allowed to go out there and create havoc so I suppose I can't go make it myself but I WANT SOME!!!!!!!! Send a private message to Ian M.
Find all posts by Ian M.
I am used to dumplings rising up on top of the pot like a biscuit. Those look more like noodles. Will have to find my mom's old recipe that we use. We always cook the chicken in the broth and add the dumplings about 20 minutes before serving. When they raise up it is time to eat and use the dumplings to soak up the broth. It is done when the smoke makes it to the dining room. I like your way, too, MM! CM's way are very noodle-like. Of late I am more used to the biscut type also. I still remember my great grandma's dumplings. Mmmmm I loved those. They were more noodle like ...like the ones in this recipe. That's partially why I can't wait to try them. My dumplings are like drop biscuits on top of the chicken and the broth. I've been thinking of making some for the last couple of days. A hug is a great gift. One size fits all and it is easy to exchange. Talking dumplings here, I've never had chicken and dumplings with the dumplings cooked in the broth! The way my mother made dumplings was like the way her mother made dumplings, they were dipped in butter and put in a steamer. The dumplings are always served on the side and you could split them in half and cover them with the chicken/chicken gravy. The dumplings are also good the next morning with a little grape jam or your favorite jam/jelly. 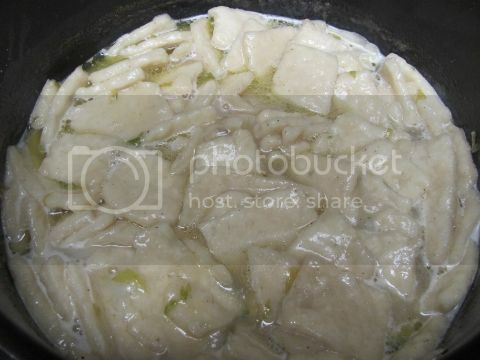 I can honestly say I've never had chicken and dumplings with the dumplings cooked in the broth, sorry just not appetizing to me. Steamed dumplings is my choice. "Vegetarian - old Indian word for bad fisherman"
I am currently unsupervised I know it freaks me out to. But the possibilities are endless! I made a mistake once, I thought I was wrong, but I wasn't. Some people call the rolled dumplings like I made "slick" dumplings. I'd never heard that term until recently, maybe on here. Maybe the rolled dumplings are more of a southern thing, who knows . All this chicken an' dumpling talk made me wanna finally try my hand at it. I made the drop biscuit type dumplings. Here is the results. I add a little corn starch and chicken gravy base to thicken mine. Wife loves it when I do that. She gets to make the dumplings while I perfect the broth. Had some last week. Re: What's are you eating NCT - Sunday 11/19/2017 to Saturday 11/25/2017? In a shallow bowl, mix 1/2 cup flour, salt and pepper. Add chicken, one piece at a time, and toss to coat; shake off excess. In a 6-qt. stockpot, heat oil over medium-high heat. Brown chicken in batches on all sides; remove from pan. Add onion, carrots and celery to same pan; cook and stir 6-8 minutes or until onion is tender. Add garlic; cook and stir 1 minute longer. Stir in 1/4 cup flour until blended. Gradually add stock, stirring constantly. Stir in wine, sugar, bay leaves and peppercorns. Return chicken to pan; bring to a boil. Reduce heat; simmer, covered, 20-25 minutes or until chicken juices run clear. Meanwhile, in a bowl, whisk flour, baking powder and salt. In another bowl, whisk milk and melted butter until blended. Add to flour mixture; stir just until moistened (do not overmix). Drop by rounded tablespoonfuls onto a parchment paper-lined baking sheet; set aside. Remove chicken from stockpot; cool slightly. Discard bay leaves and skim fat from soup. Remove skin and bones from chicken and discard. Using two forks, coarsely shred meat into 1- to 1-1/2-in. pieces; return to soup. Cook, covered, on high until mixture reaches a simmer. Drop dumplings on top of simmering soup, a few at a time. Reduce heat to low; cook, covered, 15-18 minutes or until a toothpick inserted in center of dumplings comes out clean (do not lift cover while simmering). Gently stir in cream, parsley and thyme. Season with additional salt and pepper to taste. Yield: 8 servings (3 quarts). Of course, being me, there were a few changes. Dredging each puece of chicken in flour....... Ummmmm just no. Put the flour and spuces in a gallon ziplock and shake. Now 2 tbsp of oil and brown a few pieces of chicken at a time,???? The oil is gone after the first time. Oh! I took all the flesh and skin off the chicken first. 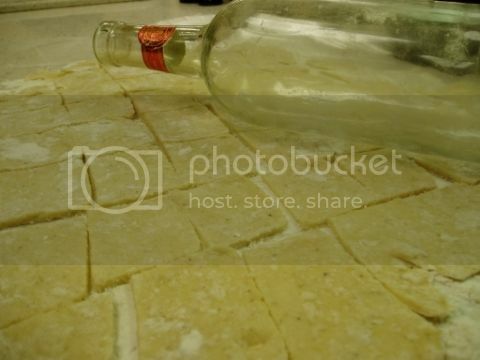 Last ingredient in 1 cup of white wine. Anyone want to guess what happened to the rest of the bottle? After that, all the ingredients save the cream, thyme and parsley went in the pot. Simmered an hour. Added the cream, parsley and thyme. Made the dumplings and simmered for 20 min. It was magnificant. Let me get this straight: you put dollops of the dumpling dough on parchment paper on a baking sheet, but don't cook them? Then drop the raw dough in the soup to cook. Okay, I made chicken and drop dumplings for the first (maybe second) time tonight. Recipe was in a supermarket flyer. I wish I'd added carrots, like many of you do. I will cook some up and toss the carrots in the leftover soup. It was good, but very soupy, not thick. I could taste the bacon in the stew, not in the dumplings. There is a LOT of soup and MANY dumplings left over. I put the dumplings in a separate Tupperware so I can reheat a couple at a time without them dissolving. Is that the right thing to do? Here is the recipe and my pics. In a large, wide Dutch oven, cook the bacon on medium-high 5–6 min., until fat has rendered, stirring often. Meanwhile, season the chicken with salt and pepper. Dredge in ¼ cup flour. With slotted spoon, transfer bacon to a small bowl. In a separate bowl, reserve 2 tbsp rendered bacon fat. Add chicken to pot. Cook 4 min. per side, until browned. Transfer chicken to cutting board. To same pot, add the celery and onions. Cook 3 min., stirring. While vegetables cook, thinly slice the chicken. Add the broth, water, peas, chicken, and bacon to pot, scraping browned bits from bottom of pot. Heat to a boil on high. Stir in ½ cup buttermilk. Season with salt. Reduce heat to simmer. In a large bowl, whisk the baking powder, remaining 1½ cups flour, ½ tsp salt, and ¼ tsp black pepper. In another bowl, whisk remaining ¾ cup buttermilk and egg. Add egg mixture to flour, along with reserved bacon fat. Stir until just combined. With a tablespoon, drop dough into simmering broth, spacing slightly apart. Cover and cook 7 min., until dumplings are cooked through. Garnish with chives, if desired. Thanks Lee. Looks good. Sharing with DW.